The China Mangrove Conservation Network (CMCN) invited myself as MAP’s Asia Coordinator to assist with a three day training workshop (April 22-24, 2013) with the objective to help build capacity of the Chinese mangrove reserve staff and rangers. The workshop was sponsored by College of the Environment and Ecology, Xiaman University with funding support from the SEE Fund, a Chinese entrepreneur Corporate Social Responsibility foundation. I was given the entire afternoon of the first day to present on mangrove conservation with a special focus on community development and engagement. To-date Chinese mangrove reserve management has played little attention in working in the surrounding communities to build their mangrove awareness and help them see the mangrove nature reserves in a more positive light, rather than just the strict enforcers of regulations which impacts their livelihoods. Workshop participants at Xiaman University; Seated center is Dr. Qingshun Quinn Li, Dean of the College of Environment & Ecology and to his right Professor Wang Wenqing of the College. The workshop participants came from four different National Mangrove Nature Reserves. Following the workshop participates from each of the reserves will implement their own mini-projects at their reserve, with support from CMCN, so staff have the opportunity to put some of the theory into practice through learning-by-doing. Three of the reserves have drawn up proposals which focus on environmental education as the entry point into the surrounding communities and schools. The fourth reserve will focus on developing an alternative supplementary livelihood through bee keeping and honey production near the mangroves. The idea is to develop a specialty honey produced by bees pollinating mangroves which could be marketed to mangrove reserve visitors as a premium mangrove product. Besides the income generated it will provide an incentive for local villages to ensure the health of the mangroves for future honey production. On the final day a field trip to Crocodile Island or Eyuyu Island as it’s known in Chinese, took place by taking a short boat trip about 5 km off Xiaman. The purpose of the trip was see the handiwork of Mr. Lin Beishui, who has single handily reforested the entire island on his own initiative over a 20 year period at great expense for a simple fisherman and who has suffered a lot of ridicule from his friends for wasting his time and money. He even went to the extent of borrowing money in order to fulfil his dream of returning a barren eroding island to a state of vegetated greenery. After meeting Mr. Lin he took on us on a walking tour of the island which was a true inspiration to see what the determination and stubbornness of a single person can achieve. To learn more about Mr. Lin, the modern day Chinese version of American legend Johnny Appleseed, please see MAP NEWS #308 edition, Feb.16, 2003. Since 2003 CMCN has been assisting Mr. Lin with mangrove restoration on Crocodile Island, but more importantly using the island site for volunteers to get involved in hands-on mangrove learning right in the mud. Also CMCN along with academics have undertaken some mangrove research. Please MAP NEWS #303 edition, Dec. 8, 2012 for more information. 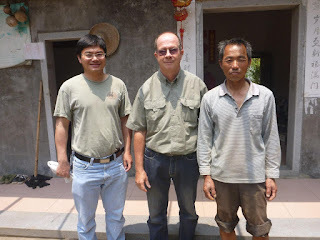 But probably the most important part of the volunteer experience is the inspiration to young visitors through meeting Mr. Lin and his son, Lin Dasheng and hearing their personal story while on the green island. This accomplishment provides some hope in an area where rapid coastal development is quickly destroying large areas of the natural environment. CMCN is a very active NGO with seven fulltime staff and lots of student volunteers based in Xiaman, Fujian Province and their work focuses on mangrove education, awareness raising, conservation, planting and community development. CMCN’s started in 2001 with roots going back to the Greenwild Association based at Xiamen University which grew into the China Mangrove Protection Project (CMPP) and finally CMCN. Mr. Lui Yi is the founder and motivator for starting these grassroots organizations, first as a student, when there was very little attention or concern for mangroves along China’s southeast coast. MAP’s records show Mr. Lui Yi started correspondence with us in 2004 sharing information, reports and photos of their activities with students. 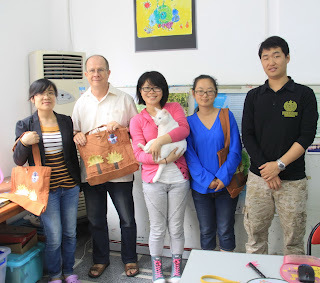 More recently Martin Keeley, MAP’s Education Director for the past several years has been working with CMCN to introduce the Marvelous Mangrove curriculum into Chinese schools which has cemented this earlier networking information exchange. In 2008, when Lui was a 26-year-old student, in his last year for his master's degree at Xiamen University, he was honored by winning the Whitley Award from Whitley Fund for Nature (WFN) a British charity. Liu Yi became the youngest ever recipient of a Whitley Award which was presented by HRH The Princess Royal (Princess Anne) at the Royal Geographical Society in London for his efforts in restoring and expanding the mangrove forests that protect coastal communities from sea surges and benefit biodiversity in the southeastern coast of China. The award provided a huge psychological and financial boost to CMCN’s mangrove conservation movement which continues today.